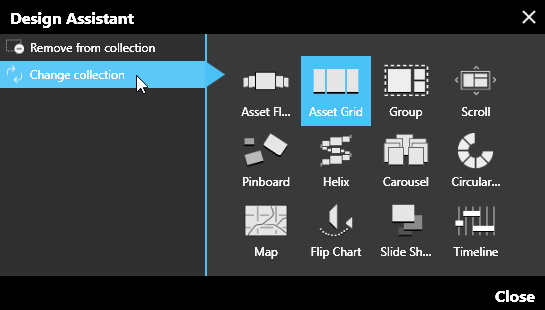 The Design Assistant simplifies your ability to change the configuration of a collection. You have access to all collection options and the ability to remove items from a collection entirely. All collections in Intuiface have two tags attached the upper-right corner of their container. The higher tag opens the Quick Properties panel, the lower tag opens the Design Assistant. Remove from collection This option takes all items out of the collection and places them, individually with the scene or experience layer that contained the collection. 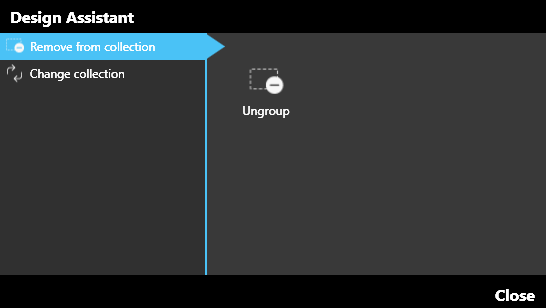 Choose Ungroup to initiate the removal. Change collection This option is used to convert the existing collection style into any other style. Choose the style you wish to adopt and the change is applied immediately.